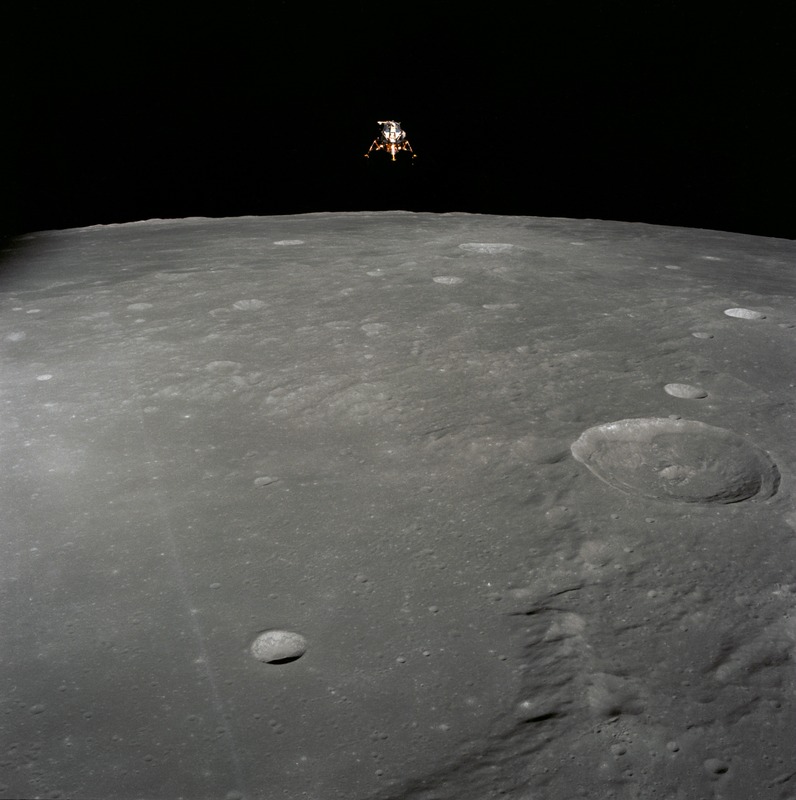 The Apollo 12 <https://www.nasa.gov/mission_pages/apollo/missions/apollo12.html> Lunar Module (LM), in a lunar landing configuration, is photographed in lunar orbit from the Command and Service Modules (CSM) on Nov. 19, 1969. The coordinates of the center of the lunar surface shown in picture are 4.5 degrees west longitude and 7 degrees south latitude. The largest crater in the foreground is Ptolemaeus; and the second largest is Herschel. Aboard the LM were astronauts Charles Conrad Jr., commander; and Alan L. Bean, lunar module pilot. Astronaut Richard R. Gordon Jr., command module pilot, remained with the CSM in lunar orbit while Conrad and Bean descended in the LM to explore the surface of the moon. 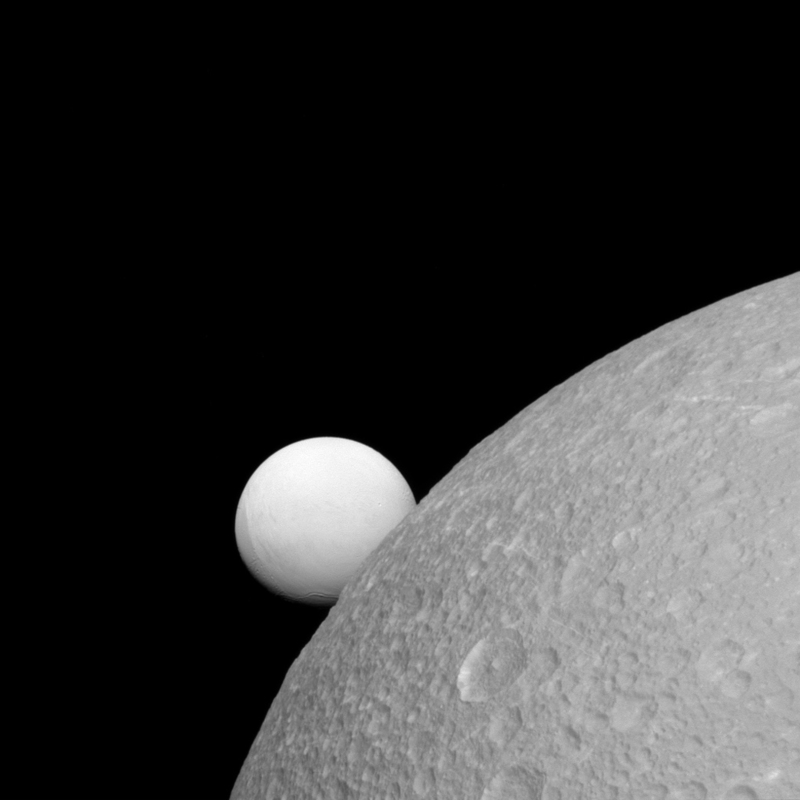 Although Dione (near) and Enceladus (far) are composed of nearly the same materials, Enceladus has a considerably higher reflectivity than Dione. As a result, it appears brighter against the dark night sky.The surface of Enceladus (313 miles or 504 kilometers across) endures a constant rain of ice grains from its south polar jets. As a result, its surface is more like fresh, bright, snow than Dione's (698 miles or 1123 kilometers across) older, weathered surface. As clean, fresh surfaces are left exposed in space, they slowly gather dust and radiation damage and darken in a process known as "space weathering. "This view looks toward the leading hemisphere of Enceladus. North on Enceladus is up and rotated 1 degree to the right. The image was taken in visible light with the Cassini spacecraft narrow-angle camera on Sept. 8, 2015.The view was acquired at a distance of approximately 52,000 miles (83,000 kilometers) from Dione. Image scale is 1,600 feet (500 meters) per pixel. The distance from Enceladus was 228,000 miles (364,000 kilometers) for an image scale of 1.4 miles (2.2 kilometers) per pixel.The Cassini mission is a cooperative project of NASA, ESA (the European Space Agency) and the Italian Space Agency. The Jet Propulsion Laboratory, a division of the California Institute of Technology in Pasadena, manages the mission for NASA's Science Mission Directorate, Washington. The Cassini orbiter and its two onboard cameras were designed, developed and assembled at JPL. The imaging operations center is based at the Space Science Institute in Boulder, Colorado. For more information about the Cassini-Huygens mission visit http://saturn.jpl.nasa.gov <http://saturn.jpl.nasa.gov/> or http://www.nasa.gov/cassini <http://www.nasa.gov/cassini> . The Cassini imaging team homepage is at http://ciclops.org <http://ciclops.org/> . An image of the sun taken with the Extreme Ultraviolet Imager aboard STEREO-A, which collects images in several wavelengths of light that are invisible to the human eye. This image shows the sun in wavelengths of 195 angstroms, which are typically colorized in green. On Nov. 9, 2015, NASA’s Solar and Terrestrial Relations Observatory Ahead, or STEREO-A, once again began transmitting data at its full rate. For the previous year, STEREO-A was transmitting only a weak signal—or occasionally none at all—due to its position almost directly behind the sun. 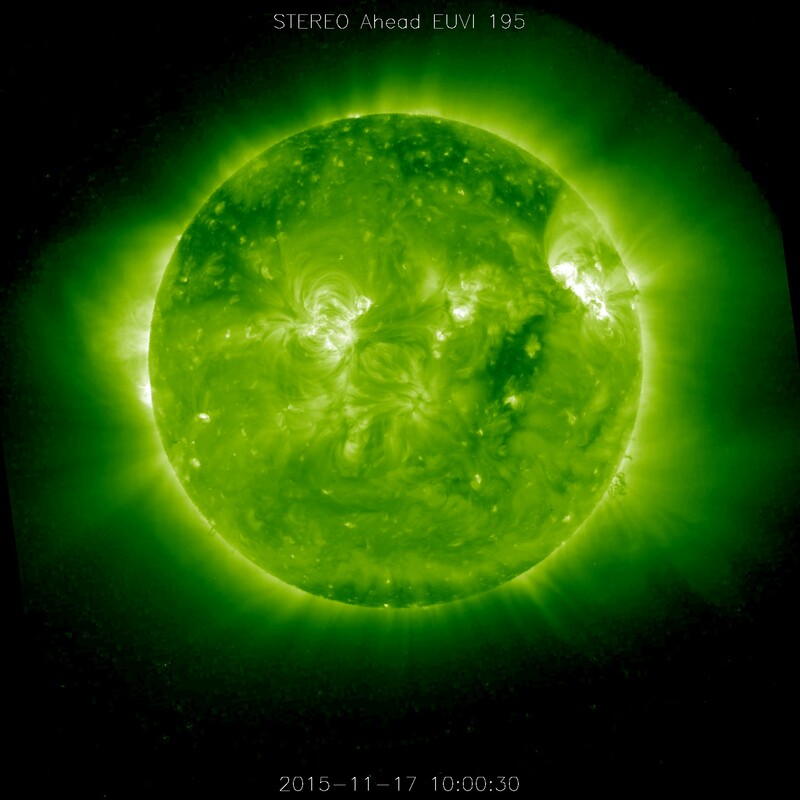 Subsequently, as of Nov. 17, STEREO resumed its normal science operations, which includes transmission of lower-resolution real-time data—used by scientists to monitor solar events—as well as high-definition, but delayed, images of the sun’s surface and atmosphere. One of the key components of the real-time data, known as beacon data, is what's called coronagraph imagery – in which the bright light of the sun is blocked out in order to better see the sun's faint atmosphere. Coronagraphs are key for monitoring when the sun erupts with a coronal mass ejection, which can send a giant cloud of solar material out into space. Such space weather can lead to interference with radio communications, GPS signals and satellites. For the past year, however, beacon data was only received for a few hours each day—if at all—limiting scientists’ ability to monitor the sun. Since August 2014, our line of communication to the spacecraft was so close to the sun that pointing the antenna straight at Earth also meant pointing it nearly directly at the sun, which would cause the spacecraft’s antenna to dangerously overheat. Now that STEREO-A has emerged from behind the sun, scientists have once again pointed the main lobe of STEREO-A’s antenna towards Earth and the stronger signal means that the majority of the beacon data can once again be picked up. STEREO-A is also using this stronger signal to send high-definition views of the sun’s far side with a two- to three-day delay. These detailed images of the sun’s surface and atmosphere allow scientists to better track the formation of solar events. “We’re now using STEREO-A to its fullest capabilities, given how far away it is,” said Terry Kucera, deputy project scientist for the STEREO mission at Goddard. STEREO-A’s twin spacecraft, STEREO Behind, has been out of communication since October 2014, when communications were lost following a planned reset of the spacecraft. 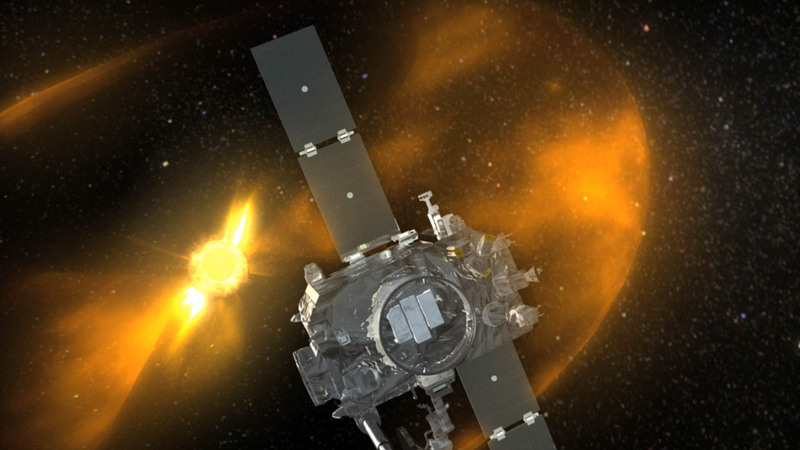 For several months, STEREO-B’s orbit took it behind the sun from our perspective, making it impossible to send messages to the spacecraft. But STEREO-B will soon emerge from the sun’s interference zone, and spacecraft operators will resume their attempts to contact the spacecraft on Nov. 30.